I stamped the background stamp on white cardstock with MFT Natural Ink which is a light tan. I then colored over the stamped images with colored pencils. It was really easy to do even though it looks like a big job! I just wish I hadn't changed the colors of greens I used throughout - it would have looked better all one color. I guess I was trying to avoid sharpening my pencils - haha. I stamped the hearts with the same ink and colored them in with pencils as well. I added some black lines on the largest one to distinquish where the roses and leaves were. I arranged the hearts under a banner with the greeting on it. I stamped it with embossing ink and embossed with white embossing powder. I wish I had done a better job at this as there is stray embossing powder all around the sentiment. Maybe the messy look is in?!?!?! I added some white Pretty Pink Posh jewels around the hearts to finish it. I also tied some of the embroidery floss in the kit around the bottom of the greeting banner (by HoneyBee - love this set). 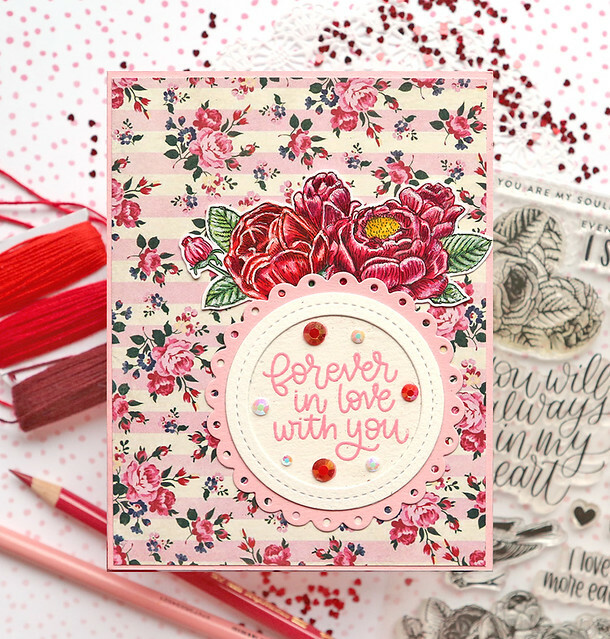 This card focuses on the papers in the kit which are gorgeous and have a vintage feel to them. I just cut the brick paper to fit on the black cardstock card base (also in the kit) and then layered some strips of the other papers over it. I stamped the sentiment from the stamp set on a black cardstock stitched rectangle using Wow embossing powder in Puffy White. 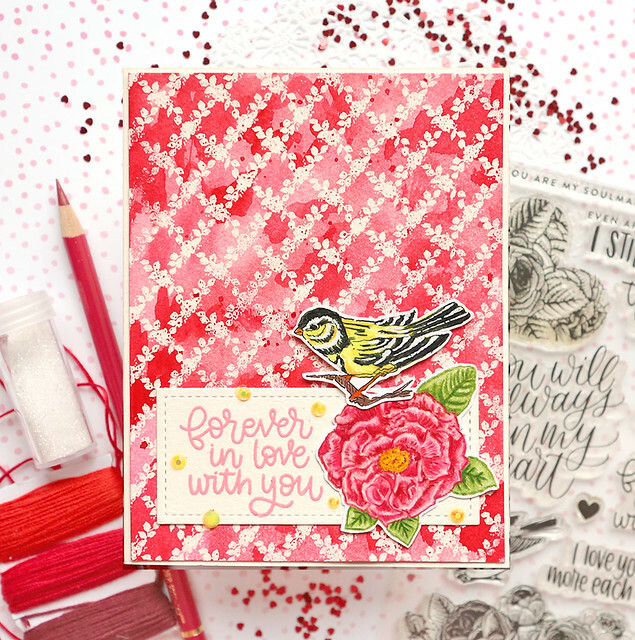 I stamped the heart in pink embossing powder and then painted over it with red watercolor. I cut around it and layered it over the greeting rectangle. I then stamped the flower with black ink and colored it in with colored pencils. I added that overlapping the heart. Last I added some white jewels around the stamped images. 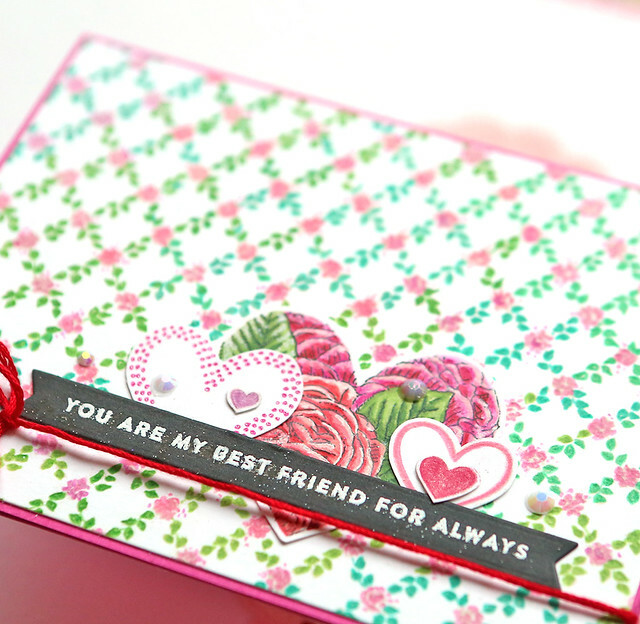 This is my favorite card as it is made with my colors - bright pinks are so me! 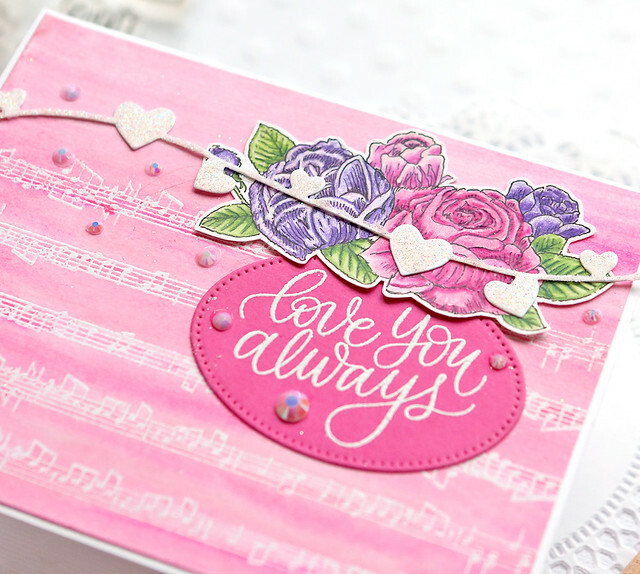 I stamped the musical notes border several times on Ranger Watercolor Paper with the clear embossing powder that came in the kit. I painted over it with Daniel Smith Opera Pink watercolor. 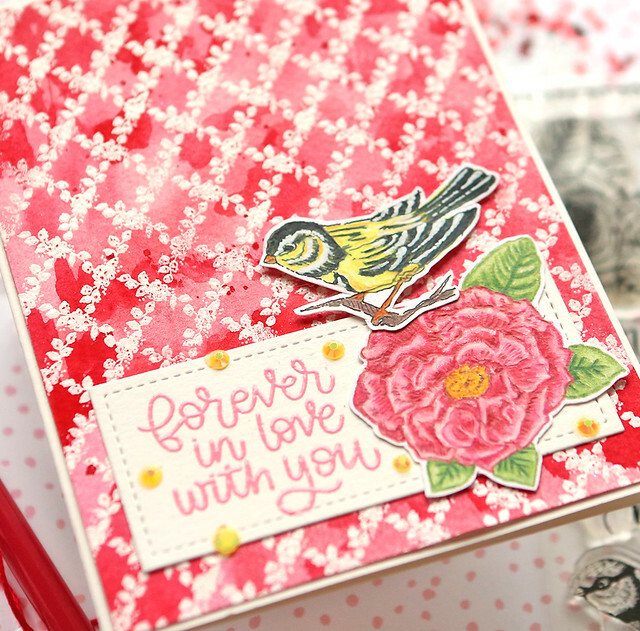 I love how the images appear once you add the paint when you use clear embossing powder. 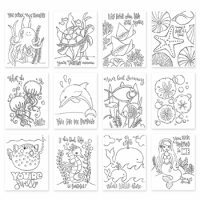 I stamped the floral stamp with black ink on white cardstock and colored the images in with colored pencils. 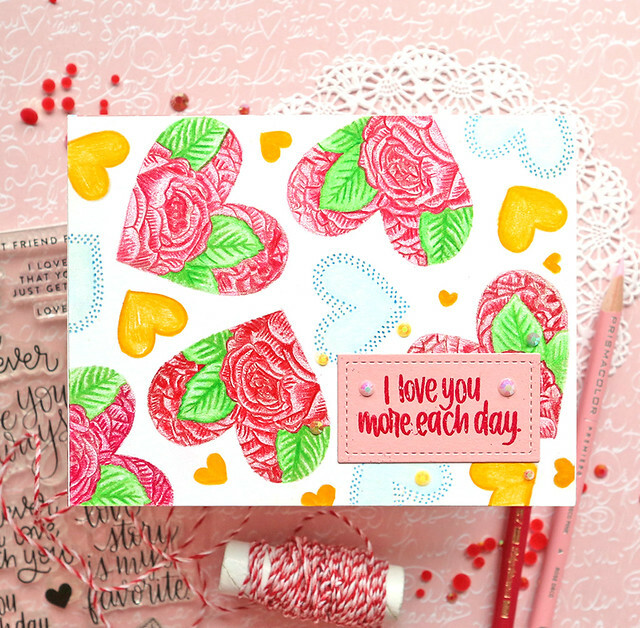 I stamped the sentiment on a stitched oval die-cut from the bright pink cardstock in the kit. I attached the flowers over the sentiment. I then die-cut a SSS heart border I have had for some time and attached some Glossy Accents and white glitter over it. I layered that over the top of the card. I finished it with some white Jewels. This is my "random stamping" card I always do (because I love puzzles and I love coloring and it basically is both combined!). 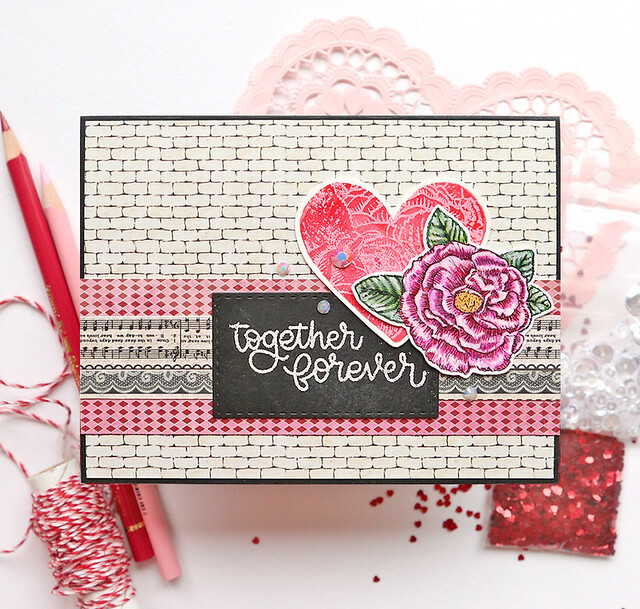 I stamped the hearts with MFT Natural Ink and then colored all of the images in with colored pencils. I used a turquoise glitter pen over the dots on the blue hearts. 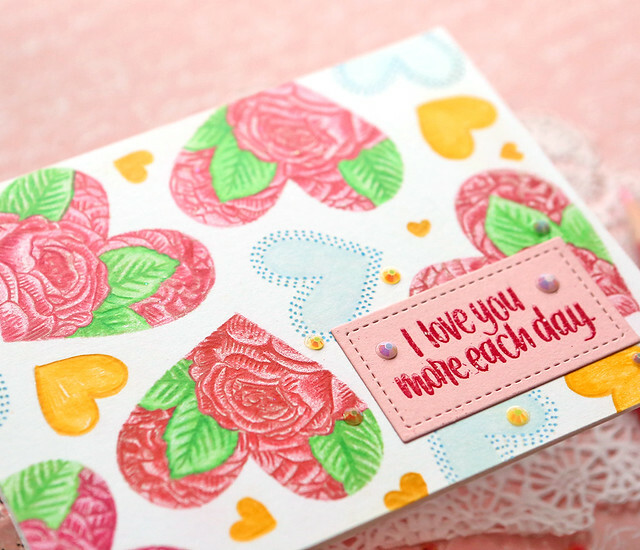 I stamped the sentiment with WOW Pink Lady embossing powder on a stitched rectangle from the Storybook 1 die die-cut from the pink cardstock in the kit. ound it. I love how I was able to make the two cards above with a totally different look than the papers in the kit by focusing on the stamp set. I stamped the large background stamp on watercolor paper and then embossed it with the clear embossing powder in the kit. The thing about clear embossing powder is the images with be the color of your paper once you paint over them. If you want white images, use Ranger watercolor paper. I wanted cream images to match the cream cardstock in the kit, so I used Fabriano watercolor paper (any standard watercolor paper except for Ranger is creamy). I painted over the clear images with red watercolor. I attached that piece to a cream cardstock base. 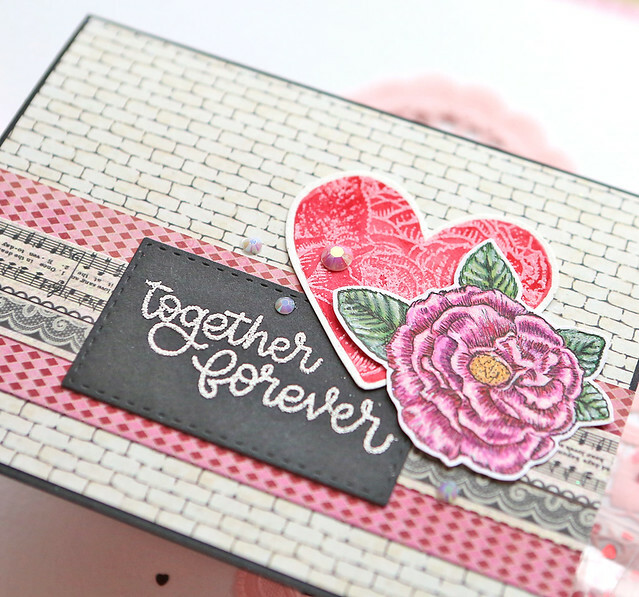 I die-cut a stitched rectangle from the cream cardstock in the kit using the PPP Storybook 2 die using Wendy Vecchi Pink Peony embossing powder. I attached that to the bottom of the card. 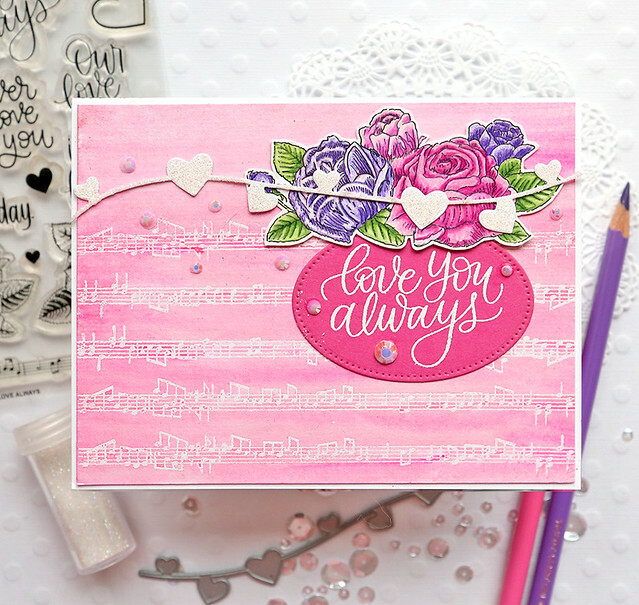 I stamped a rose with MFT Natural Ink and colored it with colored pencils. I also stamped the bird with the same ink and colored that as well. I attached those two images over the greeting rectangle. I added some yellow jewels to match the color in the bird. This was my favorite paper in the kit, so I wanted to use it on a card. It is very busy though, so I had to keep everything else very simple. I stamped the roses with black ink and colored them in with colored pencils. I attached them to the top center of the card. 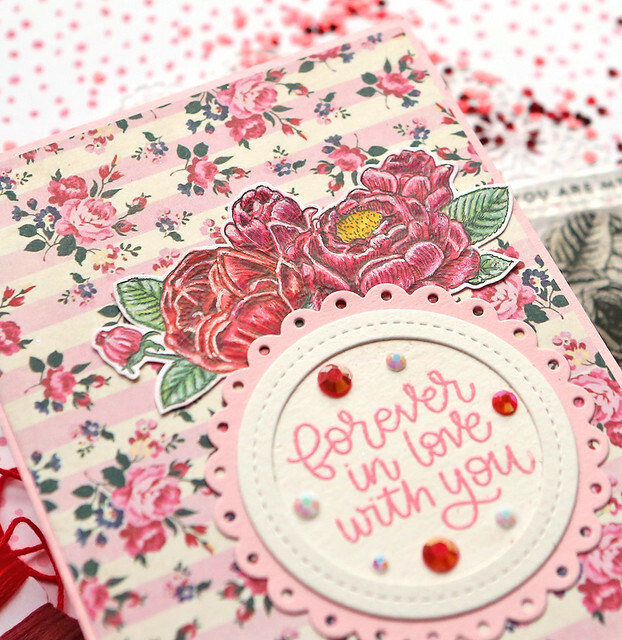 I stamped the sentiment on cream watercolor paper with Pink Peony embossing powder. 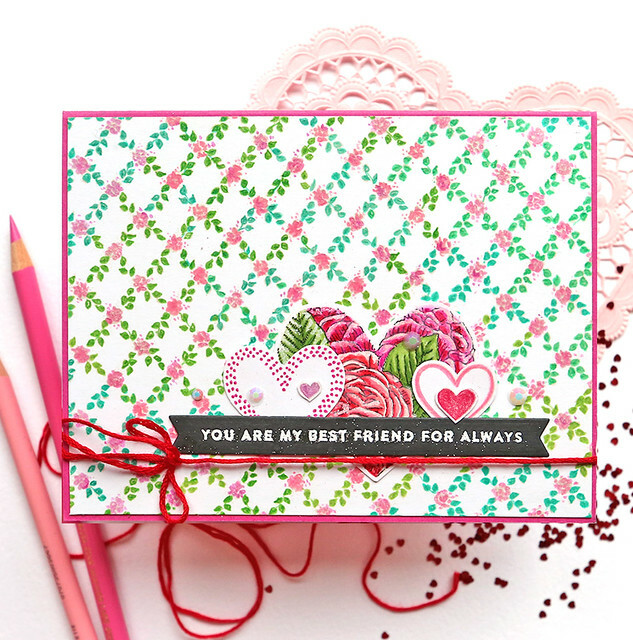 I placed that circle over a Lawn Fawn Fancy Scalloped Circle die die-cut from the pink cardstock in the kit. I added a cream circle frame as well, but I have no idea what die I used for that one (it is old and by MFT). I added some white and watermelon jewels around the greeting. Loved your cards. Where did you get the stamp for the music? Beautiful cards! I love each of them. Thank you for sharing. Beautiful cards! What great inspiration! Cant wait for my card kit to come.